Could Heartbeat Legislation Lead the Supreme Court to Overturn Roe v. Wade? With a new conservative majority on the Supreme Court, several states this year have seized on the opportunity to advance pro-life legislation aiming to overturn Roe v. Wade. One type of pro-life legislation in particular is increasingly gaining momentum on the state level—heartbeat bills which ban abortion from the moment an unborn child’s heartbeat can be detected. Because heartbeat laws ban abortion prior to “viability,” a heartbeat ban could provide the basis for a case before the Supreme Court that could see Roe v. Wade overturned. Currently, Supreme Court precedent under Roe v. Wade and Planned Parenthood v. Casey prohibits states from banning abortion prior to “viability.” According to the Supreme Court’s definition of the term, “viability” is the point at which the unborn child has the ability to survive outside its mother’s womb. Heartbeat laws, however, ban abortion as early as 6 weeks gestation, far earlier than the Court’s “viability” benchmark. As a result, heartbeat laws directly challenge the Supreme Court’s viability standard. So far this year, heartbeat bills have been introduced in 15 states. Two states—Kentucky and Mississippi—have passed heartbeat bills into law, although a federal judge has temporarily blocked the Kentucky law from going into effect until a hearing can be held. So far, heartbeat bills have also passed at least one house of the state legislatures in Georgia, Missouri, Ohio and Tennessee. 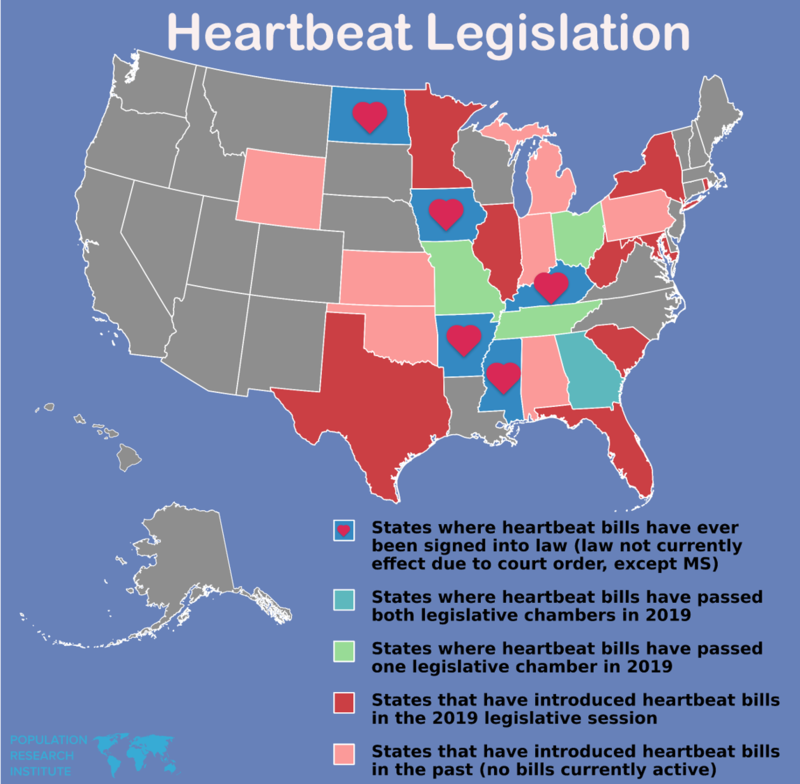 Heartbeat bills have also been introduced in Florida, Illinois, Maryland, Minnesota, New York, South Carolina, Texas, and West Virginia. Several states also introduced heartbeat legislation for the first time this year including Florida, Georgia, Illinois, Maryland, and West Virginia. Already, more heartbeat bills have been introduced this year than in any other year since the first heartbeat bill was proposed in the Ohio General Assembly back in 2011. A project page maintained by the Population Research Institute (PRI) tracks the status and history of heartbeat legislation in every state where bills have been introduced. “We think this is showing the profound respect and desire of Mississippians to protect the sanctity of that unborn life whenever possible,” Gov. Phil Bryant said upon signing the Mississippi heartbeat bill into law last Thursday, according to the Clarion Ledger. Doctors who violate the new Mississippi heartbeat law would be liable to $1,000 fine, up to six months in prison, and a suspension of their medical license. The Kentucky heartbeat law would make aborting an unborn child with a detectable heartbeat a Class D felony, punishable in that state with one to five years in prison. More heartbeat bills in other states are expected to be signed into law before the end of the year. In Ohio, heartbeat bills had passed both houses of the state legislature in 2016 and again in 2018, but both bills were vetoed by then-Gov. John Kasich who argued that the pro-life measures were likely be struck down by the courts. Ohio’s current Gov. Mike DeWine, however, has said that he will sign a heartbeat bill if passed by the General Assembly. Ohio’s 2019 heartbeat bill (SB 23) passed the Senate on March 13th and only now needs to pass the House where a similar heartbeat bill passed last year with a veto-proof majority. In Tennessee, Gov. Bill Lee has said that he will also sign his state’s heartbeat bill (HB 77) if sent to his desk. In Missouri, a heartbeat bill (HB 126) also passed the state House on February 27th, with a companion bill currently under consideration in the state Senate. Heartbeat bills in other states where pro-life lawmakers have majorities in the state legislature are also working their way through the legislative process. Last year, Iowa had also passed a heartbeat law. However, a county judge struck down the law earlier this year, declaring the heartbeat law invalid under Iowa’s state constitution. In 2013, Arkansas and North Dakota had passed heartbeat laws as well, but the 8th U.S. Circuit Court of Appeals, bound by the U.S. Supreme Court’s precedent in Roe and Casey, was ultimately forced to strike down both laws. In 2016, the Supreme Court refused to hear the Arkansas and North Dakota heartbeat law cases, leaving the 8th Circuit’s decisions in place. Some pro-life supporters in the past have criticized heartbeat bills for being too weak for failing to ban abortion outright. 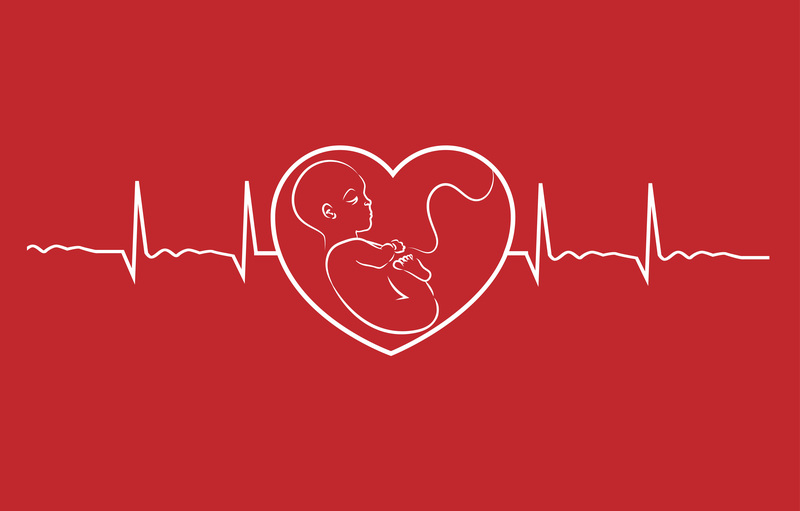 Proponents of heartbeat bills, on the other side, have argued that heartbeat legislation is useful from a legal standpoint in getting the Supreme Court to overturn Roe’s and Casey’s viability standard. Supreme Court watchers are also uncertain whether the Supreme Court would allow states to ban abortion completely, even with the two new conservative justices added to the bench. Just last month, Chief Justice John Roberts, who previously had been considered a reliable pro-life vote on the Court, drew the ire of pro-lifers when he sided with the Court’s liberal wing to temporarily block a Louisiana law that would have required abortionists to maintain admitting privileges at a hospital within a 30-mile radius. If some justices among the Supreme Court’s conservative wing adhere strictly to stare decisis in abortion cases, it may be necessary to present the Court with a case that gives justices the ability to justify an allowance of state restrictions prior to viability within the parameters of existing precedent from Roe and Casey. Heartbeat laws fall logically into Casey’s line of reasoning. In Casey, the Court acknowledged that states have “legitimate interests…in protecting…the life of the fetus” “throughout pregnancy.” If states are completely prohibited from banning abortion prior to viability under all circumstances, this “central holding” of Roe, as the Court in Casey called it, would have no significance. Moreover, the Court in Casey conceded that the demarcation point of viability can change as developments in medical technology allow for infants to survive outside the womb at earlier gestational ages. But this is also a tacit admittance that the viability standard is inconsistent in its application over time. Allowing states to enforce heartbeat laws would be more in line with Casey’s acknowledgement of the “substantial state interest” to protect the life of the unborn and would provide for a “more consistent and certain marker than viability,” as the 8th Circuit Court of Appeals has reasoned. The more heartbeat bills are passed into law, the more likely the Supreme Court will be forced to take a position on the constitutionality of these laws. And in doing so, the Supreme Court will likely have to dismantle its viability standard, a crucial step that could allow states to finally adopt significant abortion bans. Planned Parenthood v. Casey, 505 U.S. 833, 846 (1992). Planned Parenthood v. Casey, 505 U.S. 833, 876 (1992) (plurality opinion). MKB Management Corp. v. Stenehjem, 795 F. 3d 768 (2015).